Greg had been looking for a Bus but never expected to end up with one wearing such great patina! Painted perfection, a Porsche 356A coupé built in the U.K. Wearing its original 80’s paintjob, this Beetle has passed the test of time. 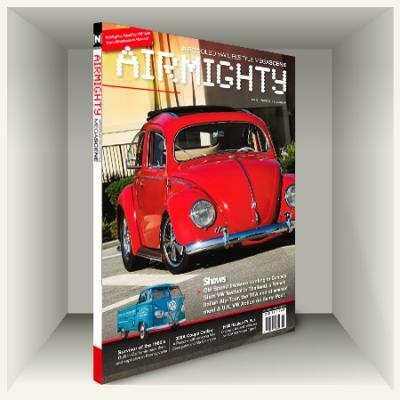 Built by AirMighty readers in Kenya. After having left the VW scene for many years Alex built a stunning ride! When a pair of rusty Type 2’s get turned into one very nice one! Just over 8.500 miles on the speedo! Built in Italy with Orange County looks in OG Cal Look style! The Old-Speed Show, an amazing gathering of Vintage Performance. Probably the U.K.’s biggest Aircooled meeting, held on Santa Pod. From all over Mexico more than 300 VW’s headed out to the Treffen!. A group of friends on a quest for the most amazing Alpine roads! When you go traveling in Thailand, hit up the Siam VW show. The last show on the VW calendar for the British Slammed VW scene! Our French correspondent about the passing of Rickie McGarity and John Preston, may they rest in peace.